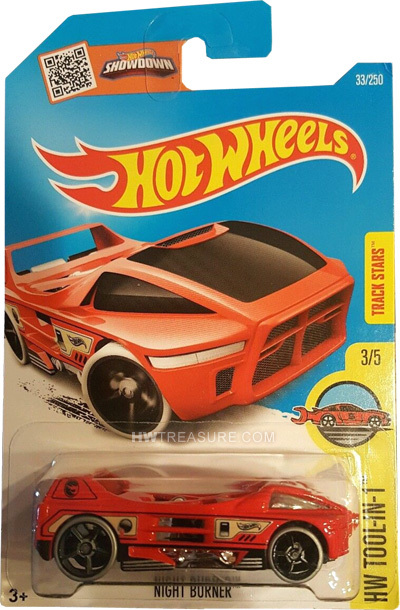 33/250 is a 2016 Treasure Hunt and 3/5 in the Tool-in-1 series. The orange vehicle is decorated with black & white graphics and the Hot Wheels logo. The low production symbol can be found on the sides of the rear spoiler. The vehicle has clear windows, a chrome interior, gray Open-Hole 5-Spoke wheels with black trim, and a black plastic Malaysia base. 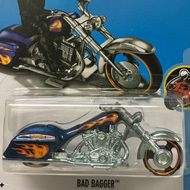 Night Burner made its debut in the 2006 First Editions series as Mega Thrust. 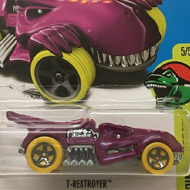 This is its third appearance as a Treasure Hunt and was previously in the 2007 set (as Mega Thrust) and the 2014 set.